The growing fleet of tankers stuck off Nigeria unable to unload their cargoes of diesel and petrol is an even-present reminder for President Muhammadu Buhari that another fuel crisis is looming on the horizon. At least 75 ships with two and a half million tonnes of fuel are waiting for importers in Africa’s biggest economy to find the dollars they need to pay for the cargoes, according to ship tracking data and fuel traders, oann.com reports. Some of the vessels arrived a month ago and their frustrated owners have almost given up hope and started to offer their fuel to buyers outside Nigeria, several traders told Reuters. A slump in world oil prices has hammered Nigeria’s state income and because crude sales are the government’s main source of revenue the fall has caused crippling shortages of dollars within the economy that have been hurting businesses for months. In a bid to break the impasse and head off more fuel shortages, the government raised the price cap for petrol by 67 percent, officially sanctioned importers to use the black market to find the hard currency they need to get cargoes off the ships and allowed any Nigerian company to import fuel. Announced last week, the reforms were welcomed by some in the oil industry as badly needed steps in the right direction. The changes have largely eliminated the system of heavily subsidized fuel prices, removing one strain on Nigeria’s increasingly stretched finances. But the so-called parallel market has struggled to cope with the demand for U.S. dollars that followed the reforms. Nigeria consumes 45 million liters of gasoline a day, or roughly 280,000 barrels, which would require the market to provide some $18 million a day. Though importers cover about 30 percent of this, with the state oil firm covering the rest, it is still a big strain on the market for dollars. The naira has already weakened due to the spike in demand for dollars from fuel importers. Last week, the U.S. currency fell to 324 naira on the parallel market, whereas the official exchange rate has been held firm just under 200. “The risk is that the parallel rate will depreciate even more, giving the marketers a pretext for yet further price increases at the pump,” said Alan Cameron, an economist covering Africa with Exotix Partners. President Buhari has resisted International Monetary Fund calls to devalue the naira, though Vice President Yemi Osinbajo sparked speculation a devaluation may be on the cards when he said the central bank had to change its polices. Nigeria has four refineries but decades of neglect mean it has to import most of its fuel, which was less of a problem when crude was at $115 a barrel and the OPEC member was the leading oil exporter in Africa ahead of Angola. As well as the slump in crude prices, which touched a 2016 low of $27 in January and were below $48 last week, Nigeria’s output has also been hit by instability in its oil producing Delta region, further reducing the state’s dollar revenues. Nigeria’s production dropped this month to 1.65 million barrels per day from 2.2 million and risks slumping to its lowest since 1970. 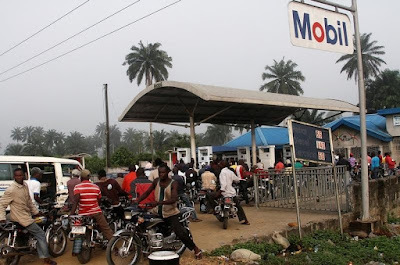 In a effort to address the looming fuel shortages, the Nigerian National Petroleum Corporation (NNPC) has begun talks with at least three international firms to swap more of its crude for gasoline, according to traders and oil executives. But the drop in output due to the unrest in the Delta – as well as the fact oil firms take more physical cargoes as payment for services when prices are low – means the NNPC has less crude to swap for fuel. Signs of trouble ahead are growing. On Saturday, Nigeria’s two main labor unions called for an indefinite general strike from Wednesday unless the government reverses its plan to increase the price of petrol, which many rely on for power generation as well as transport. Raising fuel prices is sensitive because many Nigerians see the state subsidy as the only benefit they derive from living in a major oil producing country which is nevertheless gripped by endemic corruption and poverty. The West African country tried to end fuel subsidies in 2012, doubling the price of gasoline overnight, but later reinstated some of the subsidy to end a wave of protests. The only long-term solution for Nigeria is to build its own refineries and fix the infrastructure, according to Chinedu Ukadike, chief of staff to the national president of the Independent Petroleum Marketers Association of Nigeria (IPMAN).